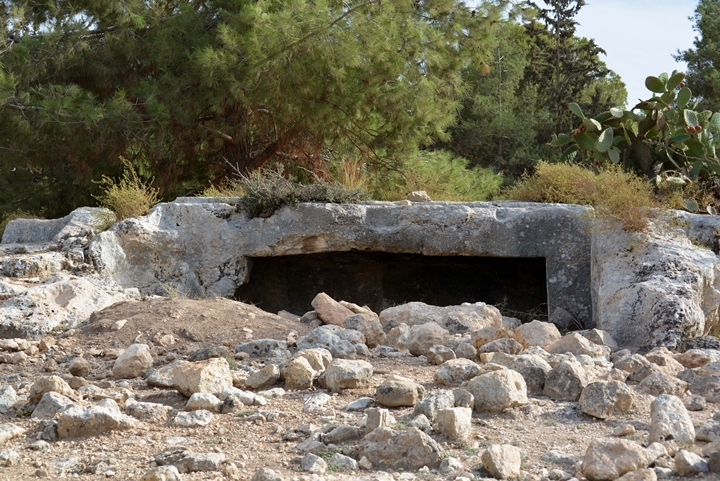 Ruins of a multi-period Biblical city located on an isolated hill above the highway #6 cross-Israel tunnel. Due to its strategic location along major roads, the city was fortified and played an important role in history of the Judean and Hasmonean Kingdoms. 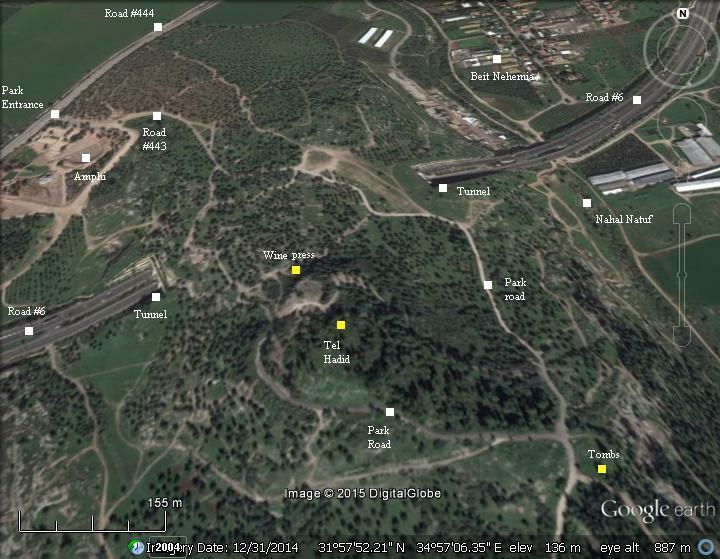 An aerial map of the area around the site is shown here, marked with the major points of interest. 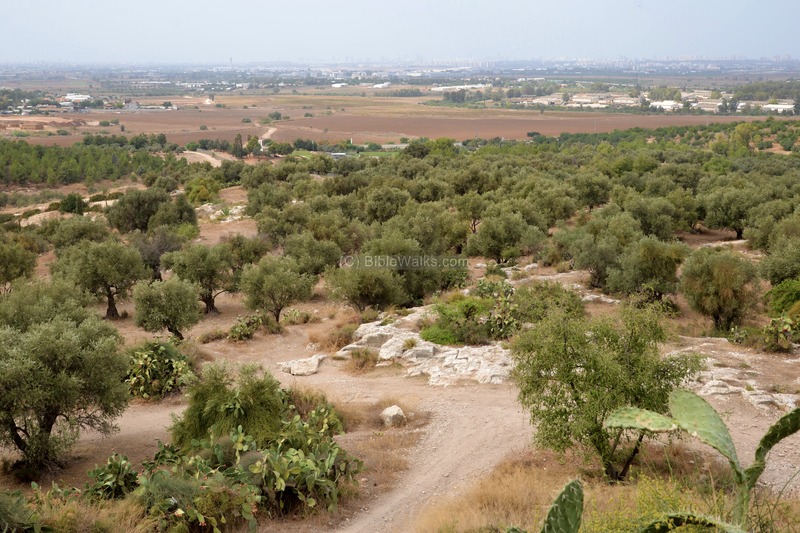 The place is located on the border of the Northern Shefela with the Judean hills, south of Nahal Natuf stream. 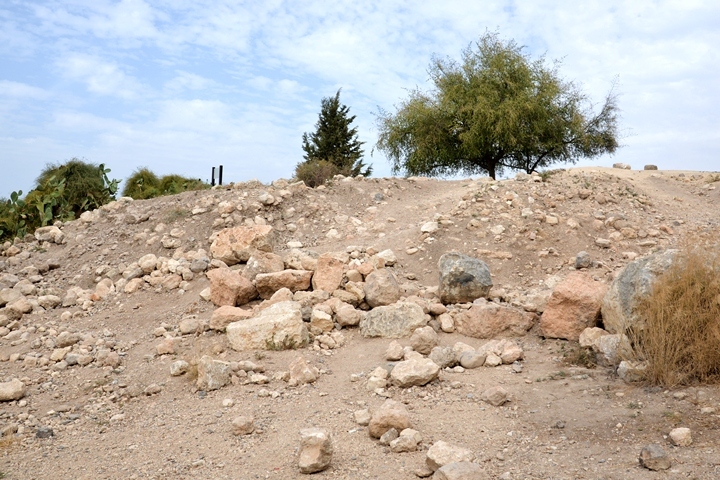 The summit of Tel Hadid is at 147m above sea level, while the valley of Nahal Natuf north of the hill is at 77m - a steep 70 m height difference which gave the city a natural defense. The site is located above Road #6 (Israel's cross highway) which passes under it by a tunnel. The access is from roads #444 and #443. The city of Hadid was established during the end of the Middle Bronze Age or during the Late Bronze period on a steep hill close to the major north-south route (Via Maris - way of the sea). The city was resettled during the Iron Age I, as dated by ceramics. A walled city has existed here during this period, as described in the Mishna, the 2nd Century AD books of Jewish practices (Mishna, Arachin 9:6): "... houses enclosed by walls from the times of Joshua son of Nun, such as ... Hadid, and Ono, and Jerusalem, ...". An excavation on the north west side of the site exposed well built structures dated to the 8th Century BC (Iron Age II). The cities and roads during the Canaanite, Israelite, Hellenistic and early Roman periods are indicated on the Biblical Map below. Hadid, marked by a red circle, is not far from Lod (Lydda). The city is located east of the major north-south route (Via Maris- way of the Sea), and near the east going roads to Samaria and Jerusalem. Hadid is south of Neballat, another second temple period town (today at the ruins of Beit Nabala). The Assyrian empire, a rising force in the region, conquered the North Kingdom of Israel in 732BC, destroying most of the cities and villages in the land. The South Kingdom of Judah managed to survive this onslaught by teaming up with the Assyrians, but not for long. After the death of the Assyrian King Sargon II (722 – 705BC), King Hezekiah son of Ahaz (reigned 715-686BC) - mutinied against the Assyrians. He joined other states in the area who attempted to free themselves from the Assyrian conquest. The Assyrian army came in 701, led by Sennacherib, son of Sargon II (2 Chronicles 32 1): "After these things, and the establishment thereof, Sennacherib king of Assyria came, and entered into Judah, and encamped against the fenced cities, and thought to win them for himself". "And as to Hezekiah, the Judaean, who had not submitted to my yoke, 46 of his strongholds, fortified cities, and smaller cities of their environs without number, with the onset of battering rams and the attack of engines, mines, breaches, and axes (? ), I besieged, I captured. 200,150 people, small and great, male and female, horses, mules, asses, camels, oxen, and sheep without number I brought out of their midst and counted as booty. He himself I shut up like a caged bird in Jerusalem, his capital city; I erected beleaguering works against him, and turned back by command every one who came out of his city gate". Jerusalem was spared from destruction and the Assyrians retreated (2 Chronicles 31 22): "Thus the LORD saved Hezekiah and the inhabitants of Jerusalem from the hand of Sennacherib the king of Assyria, and from the hand of all other, and guided them on every side". Jerusalem fell only 114 years later. 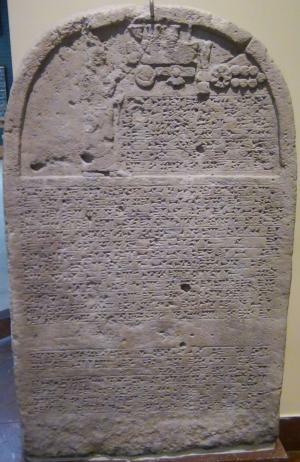 Judea continued to pay heavy taxes to the Assyrian conquerors. An important discovery : In the years 1999-2002 tunnels under Tel Hadid were constructed in order to clear a path for the cross-Israel highway #6. The archaeological salvage excavations at the northwestern foothills of Tel Hadid unearthed two important Assyrian documents. They were found near one of the excavated Iron Age II structures, and were deciphered by Prof. N. Na'aman and R. Zadok of the Tel Aviv University . The first document (G-117/95) was a bill of sale of a land written in Neo Assyrian cuneiform script, and dated to 698/7 BC. The second (G/1696) was a loan document dated to 664/3 BC. The first document is interesting, as the persons identified by the document are foreigners, probably from Babylon. As the conquest of 701 BC was too close for the sale of land of the newcomers, these scholars suggested an earlier date of the transfer of foreigners to Hadid. This implies that the land was resettled by the Assyrians at a time earlier than the Sennacherib conquest of 701 BC, rather than following that conquest which was the common knowledge. "And the king of Assyria brought men from Babylon, and from Cuthah, and from Ava, and from Hamath, and from Sepharvaim, and placed them in the cities of Samaria instead of the children of Israel: and they possessed Samaria, and dwelt in the cities thereof.". Therefore, the scholars concluded that the foreigners were resettled in the cities of Judah at an earlier date, and the deportation of the Jewish residents (as per 2 Kings 17:6) may have happened in the years 708-706 during Sargon II - the father of Sennacherib. This important finding of Tel Hadid may have rewritten the history of the Assyrian conquest . The Babylonian empire rose after the fall of the Assyrians (610BC), defeated the Egyptians (609BC) and conquered the land until the Nile (2 Kings 24 7): "... for the king of Babylon had taken from the river of Egypt unto the river Euphrates all that pertained to the king of Egypt". After two attempts of the Judean kings Jehoiakim and Zedekiah to disengage from the Babylonian conquest, Nebuchadnezzar II destroyed the Judah kingdom completely in 587 B.C. In this intrusion (587) most of the cities were leveled, and many of the people in the land were exiled to Babylon - thus bringing an end to the Kingdom of Judah. "Now these are the children of the province that went up out of the captivity, of those which had been carried away, whom Nebuchadnezzar the king of Babylon had carried away unto Babylon, and came again unto Jerusalem and Judah, every one unto his city; ... The children of Lod, Hadid, and Ono, seven hundred twenty and five". "The children of Lod, Hadid, and Ono, seven hundred twenty and one". Yet another text lists Hadid as a rebuilt town (Nehemiah 11:31,34): "The children also of Benjamin from Geba dwelt at... Hadid, Zeboim, Neballat". Ceramics of the Persian period were identified on Tel Hadid, confirming these texts. In 332 BC Alexander the Great defeats the Persians, and a new era started termed as the Hellenistic period. Israel first was under the tolerant Ptolemy-Egyptian control, but during the Seleucid-Syrian control (which started in 198 BC) the Jewish population resisted the religious changes imposed by the Seleucids. The Maccabees headed the anti-Hellenization rebellion against the Greek Seleucids . After a series of successful military campaigns (167-160 BC) they took control of Judea, liberated the land and created an independent Jewish country, known as the Hasmonean Kingdom (164-63 BC as independent state, and 63-37BC as rulers under Rome). The "Alexander the great" coins were very common during the Hellenistic period, and were then like the American dollar is today. 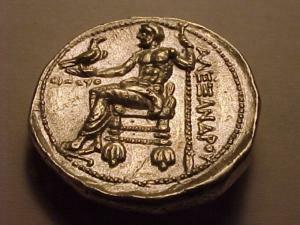 The reverse side, seen below, shows Zeus - king of the gods - seated to the left and holding an eagle on his right hand, and holding a scepter with his left hand. The Greek letters to the right ("ΑΛΕΞΑΝΔΡoΥ") spell: Alexander. "And Simon built Adiada [Hadid] in Sephela, and fortified it, and set up gates and bars.". "Now Simon heard that Tryphon was gathering together a very great army, to invade the land of Juda, and to destroy it... But Simon pitched in Addus [Hadid], over against the plain". Tryphon retreated after slewing Jonathan. Another battle was fought near Hadid between the forces of Alexander Janneus (ruled 103-76 BC) and Antiochus Dionysus/Pius, with the upper hand of the Seleucids (Josephus Flavius, Ant 13 15: 2): "He also made thence an expedition against Judea, and beat Alexander in battle, near a place called Adida; yet did he, upon certain conditions agreed on between them, retire out of Judea". These two strategic battles imply the importance of Hadid during this period, as it defended the gateway from the coast to the heart of the Hasmonean Kingdom. The settlement of Hadid during the Roman and Byzantine period is attested by the large number of Roman and Byzantine burial structures that are found on the south east side of the mound. During the Great Revolt Hadid (Adida) was fortified by the Roman general Vespesian before he left to Rome following the death of Nero (Josephus Flavius, Wars 4 9:1): "AND now Vespasian had fortified all the places round about Jerusalem, and erected citadels at Jericho and Adida, and placed garrisons in them both, partly out of his own Romans, and partly out of the body of his auxiliaries". The findings in Hadid also attest to the settlement during the Byzantine period, when the town reached a settlement peak. The city appears on a section of the Madaba mosaic map, which was discovered in 1884 in a Byzantine church in Madaba, Jordan. This ancient map, laid out in the 6th C AD, shows the map of the Holy Land, with dozens of illustrated sites. The Greek letters in this section say: "Adithaim now Aditha". A Byzantine period mosaic floor, dated to the 6th Century, was discovered on the south eastern edge of the mound. It was found in the remains of a church. The mosaic was described by the survey (site #170): "Excavation in SE of the Tel (J. Ory, 1940) exposed remains of a structure and segment of a mosaic pavement; the NE corner survives: a strip of the border, a wide frame and a corner of a carpet. In one of the corners of the frame is a depiction of a fortified town, and underneath, inscribed in Greek: 'Egypt' (ΕΓΥΠΤΟС). Displayed below is a river scene of fishes, ducks and vegetation, as well as a sailboat laden with a cargo of wine vessels, and two men. On the other side of the frame is a hunting scene. The carpet center consists of medallions, in which two incomplete Greek inscriptions were preserved. The mosaic segment from El Haditha is displayed in the Maritime Museum, Haifa". The town was destroyed following the Arab conquest. An Arab town was built over the ruins of the Byzantine period town, and named el Haditheh, which preserved the ancient Hebrew name. Conder and Kitchener surveyed this area during the Survey of Western Palestine (SWP) in 1873. A section of the survey's map, part of Sheet 14, is shown here. "Haditheh - A moderate-sized village on a terraced Tell at the mouth of a valley at the foot of the hills, with a well on the east. There are remains of a considerable town round it, tombs and quarries exist; and the mound on which the village stands is covered with pottery. This would appear to be the town of Hadid mentioned with Lod and Ono. (Ezra ii.33; Neh. vii. 37, xi. 34.) In the 'Onomasticon' it is called Aditha, and placed east of Lydda. The name cannot apply to position on a 'sharp' ridge, but might perhaps be better rendered 'boundary.' It is possible that this is intended by Adida (1 Maccabee xii. 38), as that place was an eminence in the Shephelah". "At a quarter of an hour's distance south-east of Haditheh, Guerin found several ancient tombs cut in the rock. The village of Haditheh he found to be on the site of an ancient town. Cisterns, a birket, tombs, and rock-cut caves, with cut stones scattered about, are all that remain". The Arab village of Haditheh was destroyed during the independence war in 1948. On a hill on the north west side is the village's cemetery. 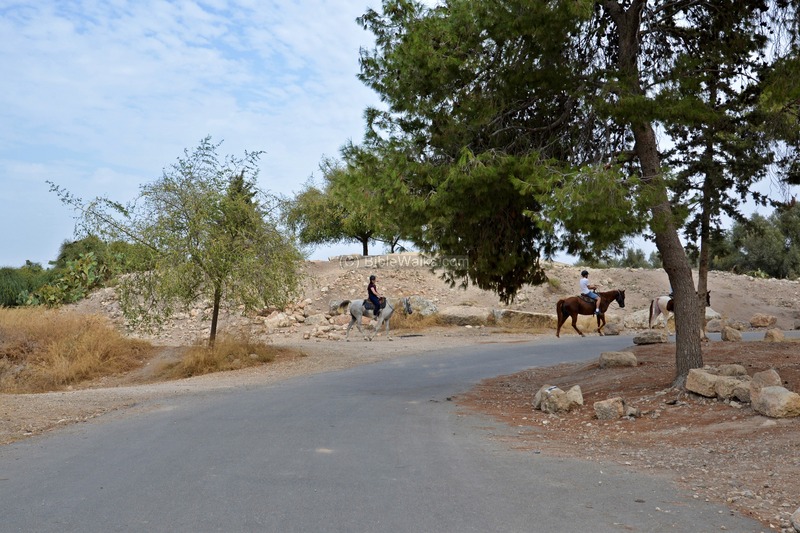 In 1949 a new farming settlement of Moshav Hadid was established to the west of Tel Hadid. 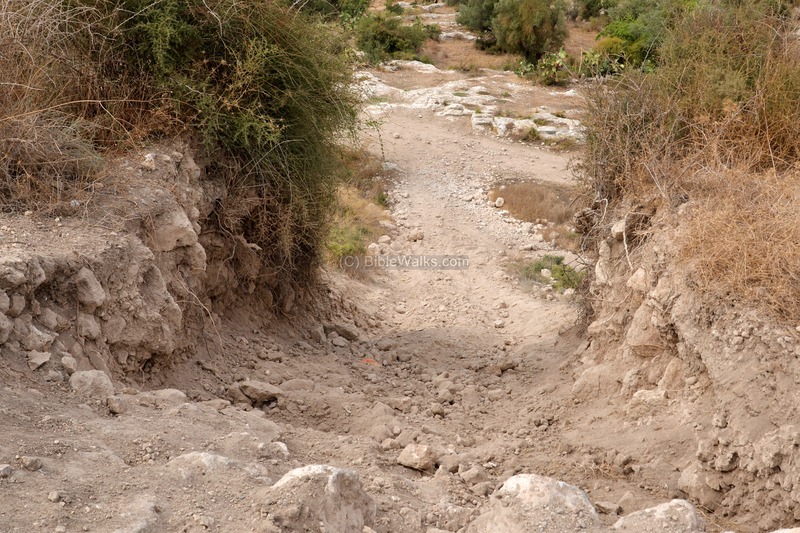 In 1999-2000 the builders of the cross-Israel highway (#6) had to find a way to cross the hill. Due to religious extremists who did not allow to damage the Jewish tombs on the hill, the planners had to construct a tunnel. Salvage excavations were conducted in the area of the tunnels, which unearthed important findings of the Iron Age II period. The area of Tel Hadid is today a part of a KKL forest area, and open to the public. Tens of thousands of vehicles pass under Tel Hadid daily, but do not know its rich history, and should. “History dies without the present. There is no future without the path made to it by the past.” (Aidan Chambers). The following aerial view was captured by a quadcopter over the site in October 2015. This view of the summit is from the west side. A view towards the north shows the end of the tunnel on the other side. In the left background is Moshav Beit Nehemia. The park road #443 loops around from the east side and reaches the top of the hill. Here is a large parking and picnic place. The park area around Tel Hadid is a popular recreation place, including horse riding as seen in this photo. 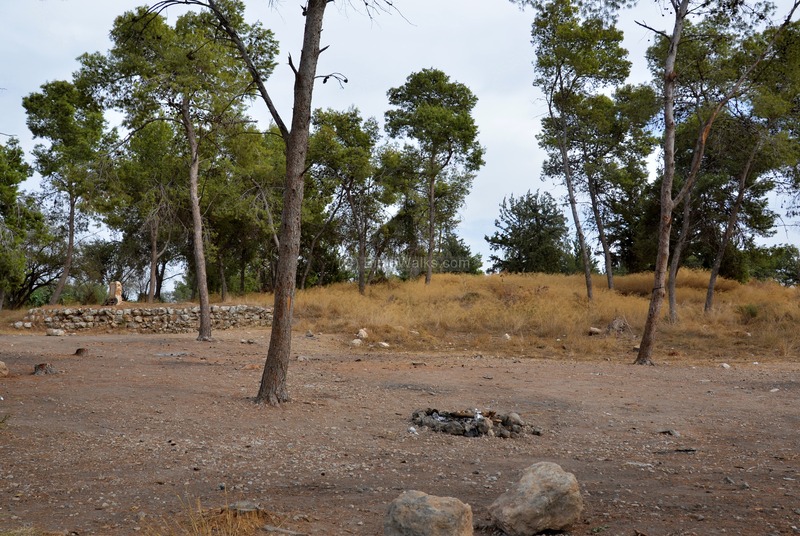 This area is part of the KKL Ben Shemen forest. The Israel National trail passes through this point. On the west side of the summit is a raised area with traces of ruins. From this point is an observation point, with great views of the Shefela, the Judean plain, the Dan (Tel-Aviv) metropolis and the coastline. Around the hill is a large grove of ancient olive trees, covering an area of 1000 dunams (100 hectares). 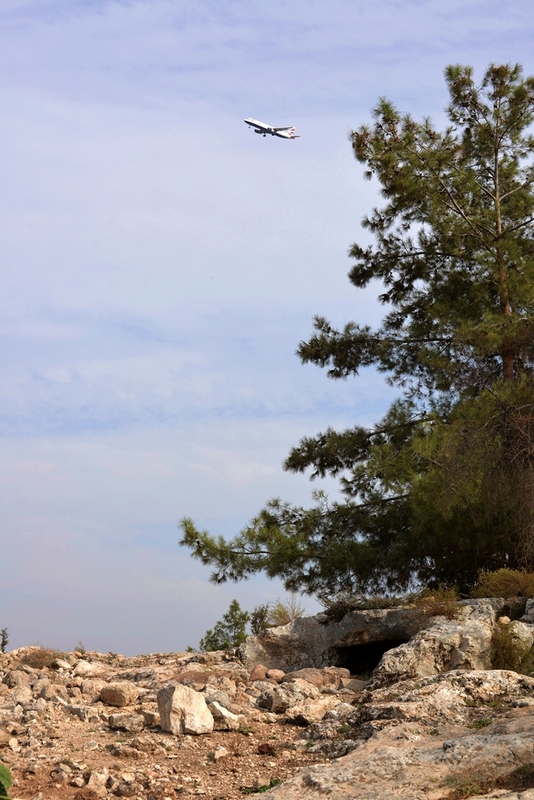 The area of Tel Hadid is a favorite site for motor bikes and all-terrain vehicles (ATVs). The ancient wall on the western side of the summit was breached by the off-road vehicles that dare the steep slope. On the west side of the summit, close to its foothills, is the largest ancient wine press in the country. 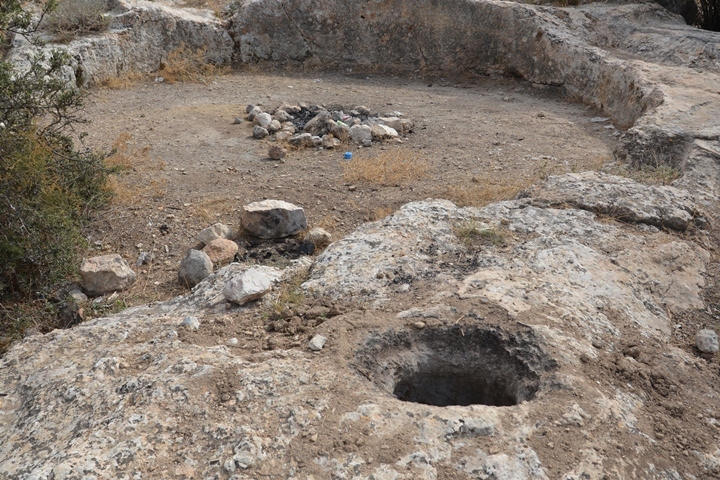 The archaeological survey (map segment Lod 80, site #170) described this installation: "rock-hewn winepress (damaged by later cuttings): circular treading floor, with trapezoidal cells on east, each cell, apparently, with a plastered collecting vat. One of the vats was lined with plaster embedded with Byzantine shreds (later restoration?). Surrounding winepress - rock-cut cup marks and depressions for placement of jars". The photo above was captured by a drone, and a ground view of the circular treading floor and rock cut depression is seen below. On the south east side of Tel Hadid is a large number of rock hewn burial structures, dated to the Roman-Byzantine period. This photo shows the entrance to a wide burial cave. Also seen in this photo is a landing passenger plane, as the eastern approach to Ben-Gurion airport passes above the site. "Roman-Byzantine burial cave (1 .5 m deep) at edge of spur, descending E to Nahal Natuf. Facade, facing NE, has rock-cut entrance (3.6 m wide) with carved lintel (sides 0.55 m wide, upper part of entrance 0.38 m wide), flanked by protruding carved jambs (protruding c. 0.3-0.4 in), perpendicular to the facade. Scattered worked building stones inside cave. Ceiling bears traces of soot, apparently related to recent activity. Near cave facade - worked building stones, including one particularly large stone (0.5×O.6×1.3 m) and a threshold with holes; these are apparently remains of a Roman structure". "Above the east portion of the cave - two arcosolia tombs [rock-cut sarcophagi surmounted by arches] and straight-angled cuttings. 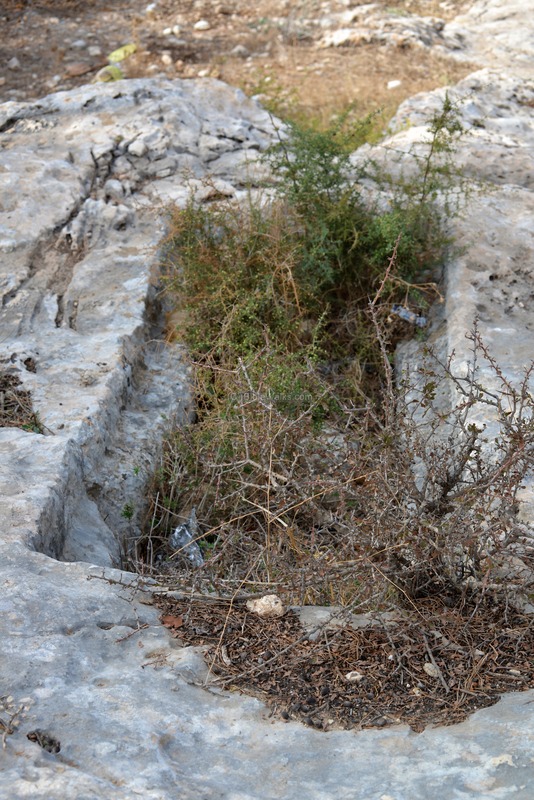 Some 15 m from the cave - two arcosolia tombs cut into a rock outcrop and a recent grave. Some 30 m from the cave - a bell-shaped cistern. On NW slope of spur - arcosolia tombs and a winepress with a niche cut in side of treading floor". In this photo is a cist grave - a stone-built coffin-like box or ossuary used to hold the bodies of the dead The cover slab is missing. The park is a center of recreation. 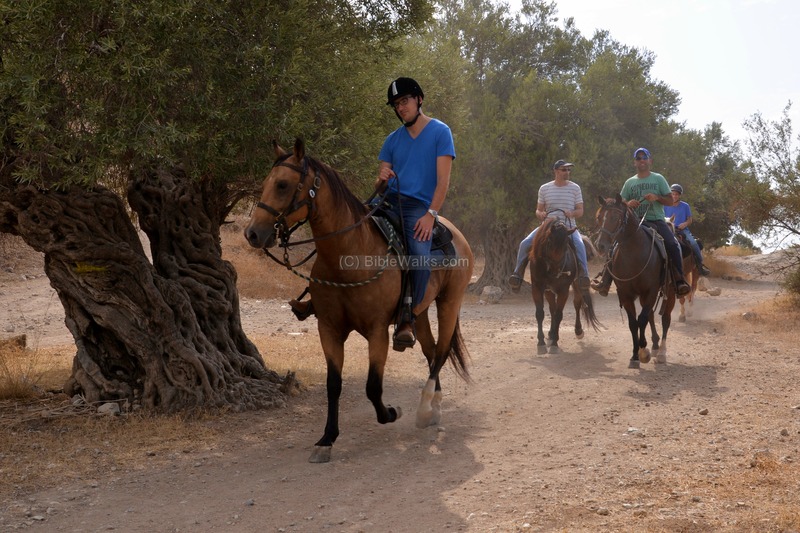 The outdoor activities include picnics, horse-riding, and off-road vehicle driving. Moshav Hadid - a farming settlement 2KM west of Tel Hadid, established in 1949.